World Factbook as of October 26 2014: "Singapore has a highly developed and successful free-market economy. It enjoys a remarkably open and corruption-free environment, stable prices, and a per capita GDP higher than that of most developed countries. The economy depends heavily on exports, particularly in consumer electronics, information technology products, pharmaceuticals, and on a growing financial services sector. The economy contracted 0.6% in 2009 as a result of the global financial crisis, but rebounded 15.1% in 2010, on the strength of renewed exports, before slowing to in 2011-13, largely a result of soft demand for exports during the second European recession. Over the longer term, the government hopes to establish a new growth path that focuses on raising productivity. Singapore has attracted major investments in pharmaceuticals and medical technology production and will continue efforts to establish Singapore as Southeast Asia's financial and high-tech hub." Singapore is big in international finance. This leaves it with a large disparity in wealth. Singapore is praised for its "consistently good air quality, world-class health care, excellent infrastructure and low crime rate." The government's healthcare system has three components: a safety net for those who could not otherwise afford healthcare; a compulsory health savings scheme covering about 85% of the population in which citizens put aside part of their income for healthcare; and a government-funded health insurance scheme. Wikipedia: "Public hospitals in Singapore have autonomy in their management decisions, and compete for patients. In 2008, 31.9% of healthcare was funded by the government, approximately 3.5% of Singapore's GDP." Singapore is known for being tough on criminality. Regarding crime it is said to be the safest place in the world. And a lack of crime is good on the nation's budget. Singapore's economy has been rated as the most business-friendly in the world. Singapore is getting by with the importation of food and a favorable export/import ratio. 2013: Musician and English instructor born in Singapore complains that he doesn't "feel like I am home anymore in Singapore." He added: "I refuse to pay such a high price to live in a box that I have a lease on for 99 years." 2012: The city of Singapore is ranked the most liveable city for expatriots, trumping Hong Kong, which is now one of the worst in air pollution. The UK's Telegraph states: "More than 20 per cent [of] Singapore's population are now non-Singaporeans as more expats make the city state their home. A large number of these expats come from neighbouring China, India and Malaysia, highlighting its attractiveness to fellow Asians." Some complain that Singapore is liveable only if you are loaded with money. Someone else complains that "Singapore is a tax haven for billions in laundered money, it should be 'livable"'. Someone else: "Why would anybody want to live there, apart from bankers, traders,financiers and other wheeling-dealing riff-raff?" 2012: More arriving than leaving. A net gain of 15.62 persons per 1,000 population per year. An island just south of the Malaysia. 682.7 square kilometers of land – a little larger than the city of San Francisco (479 square kilometers). Singapore has a unicameral parliament of 84 seats, a president and prime minister. 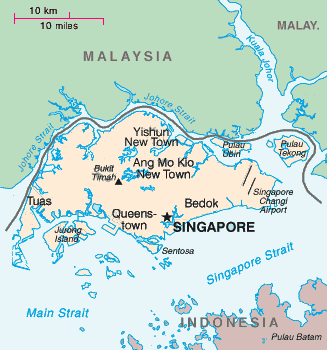 A former British colony, Singapore joined the Malaysian Federation in 1963. 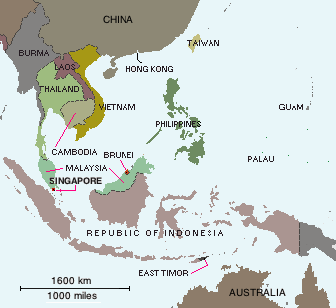 It separated from predominately Muslim Malaysia in 1965. December 19, 2004: Faster moving than some most modern states, Singapore is fining people for allowing mosquitoes to breed on their property. It is an effort to wipe out dengue fever. Singapore has had 8,500 reported cases of the disease so far in 2004, which has been fatal for a few. September 15, 2005: According to New York Times columnist Tom Friedman, Singapore "is obsessed with nurturing every ounce of talent of every single citizen." He describes its fourth and eighth graders as scoring "at the top of the Times's international math and science tests."